While some of the Early Anglo-Saxon kingdoms have yielded much archaeology, and continue to yield extensive cemeteries and settlement sites for study, others are arguably less well served. The ancient kingdom of Mercia - of particular interest to our group, could in many ways be seen as such a case, and this presents a particular challenge when attempting to recreate the effects of this purportedly powerful, wealthy and sophisticated culture. Beyond the Staffordshire Hoard (itself mostly belonging to the mid-late 7th century and containing a very selective subset of items), at a glance one might be forgiven for thinking the Midlands lacked much in the way of early Anglo-Saxon archaeology. In fact, there are a handful of archaeological sites which have yielded impressive finds, which are relevant to the earliest times of the Mercian kingdom - it is just that many were excavated in the early days of Anglo-Saxon archaeology, and their finds forgotten, lost, or hidden from view. One such case; the large cemetery of Bidford-upon-Avon, Warwickshire, initially excavated between 1923 and 1924 (Humphreys et. al., 1925) sheds valuable light on early Anglo-Saxon Mercia and has yielded many impressive finds, including a great quantity of feminine items of decidedly Anglian (rather than Saxon) affinities, including one of the most impressive square-headed brooches ever found. Among a number of warrior graves, the most impressive item, however, was a shield-boss decorated in such a way as to make it entirely exceptional, artistically, and of a status (within the British Isles) second perhaps only to the kingly shield of Sutton-Hoo Mound 1. The impressive shield-boss from Bidford-on-Avon grave 182 is not on public display, residing with the Shakespeare Birthplace Trust. 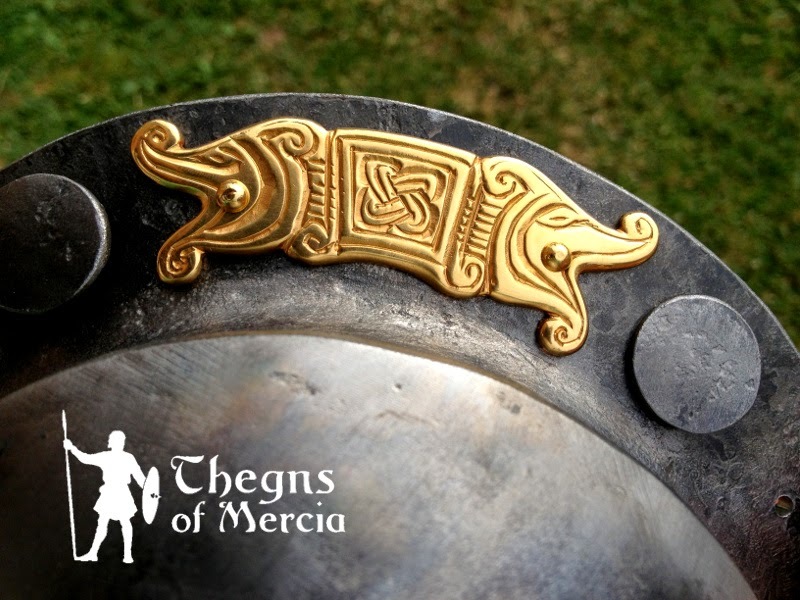 To raise awareness of this find and explore what this piece of warrior gear may have looked like in its day, in 2012 we embarked on a lengthy process to reconstruct the shield, using authentic materials and techniques. Nb. we are greatly indebted to the Shakespeare Birthplace Trust Collections Department, without who's help we could not have pieced together the story of the find. Examination of the original fragments in spring 2014, in particular, was crucial to achieving a representative reconstruction. Bidford-on-Avon, and its Anglo-Saxon sites sit in a fascinating position, on the north bank of the Avon close to the ford where the Roman road of Ickneild / Ryknild Street crossed the river, making its way north to join Watling Street at Letocetum (Wall) near modern Lichfield; the heartland of Mercia (Naylor & Richards, 2010). Bidford-on-Avon - south bank, looking across the river Avon, north, towards the Anglo Saxon cemetery site. Looking south from Bidford lies the Cotswolds where Anglian influence in cemetery material gradually falls away towards the Saxon-dominated Upper Thames Valley region. The historic course of the Avon likely represented an important boundary between early Mercia and Hwicce, and there is ample reason to believe that the historic settlement at Bidford was a strategically and economically important location in the 6th and early 7th centuries, controlling the crossing point of the river and traffic along the ancient way. While inferring political allegiances in such ‘border country’ is fraught with difficulty, the balance of material produced at Bidford is of considerably more “Anglian” flavour than finds from similar cemeteries to the south, and, importantly, with the site lying on the north bank of the Avon, it is reasonable to infer that it may have belonged to an early Mercian sphere of influence long before the conquest of Hwicce in the early 7th century. The area of Bidford appears to have been continuously settled from the Iron Age, with much archaeology dating to the Roman period. However, the Anglo-Saxon cemetery (situated beneath a car-park in the modern town, on the north bank) is of considerable interest, containing around 320 burials (200 inhumations and around 120 cremations) (Naylor & Richards, 2010); the largest in the Avon valley and among the largest in the Midlands. 6th century gilded Anglian square-headed brooch from Bidford-on-Avon (1990s excavation), Warwickshire Museum. Anglo-Saxon female burial display, Warwickshire Museum, showing skeletal remains and finds from Bidford-on-Avon. While some excavations (within the scope of “rescue archaeology”) took place in the 1990s (finds now on display at Warwickshire Museum), arguably the most impressive material was excavated during the 1920s, with the collection of finds now in the keeping of the Shakespeare Birthplace Trust. For reasons to be discussed, J. Humphreys described the shield remains from this grave as “the gem of the collection” representing the “artistic skill and wonderful craftsmanship of our Anglo-Saxon forebears” (Humphreys et. al, 1925). Despite the great discoveries in early Anglo-Saxon archaeology that took place in the century following its excavation, and despite sitting out of sight and out of mind for much of that time, the shield remains from Bidford-on-Avon grave 182 remain hugely impressive and without many adequate parallels. What’s so special about this shield? The iron boss itself is a large-buttoned example of Harke-Dickinson type 2 featuring a low, concave wall, broad flange, and shallow cone; a popular style, particularly across Anglian regions in the 6th century (Dickinson & Härke, 1992) . The boss is greatly supplemented, however, with gilded copper-alloy appliques which raise the item from a sturdy piece of smithcraft to work of art. The first of these appliqués; a decorative disc affixed by solder to the apex button, is unusually large and sturdily cast. 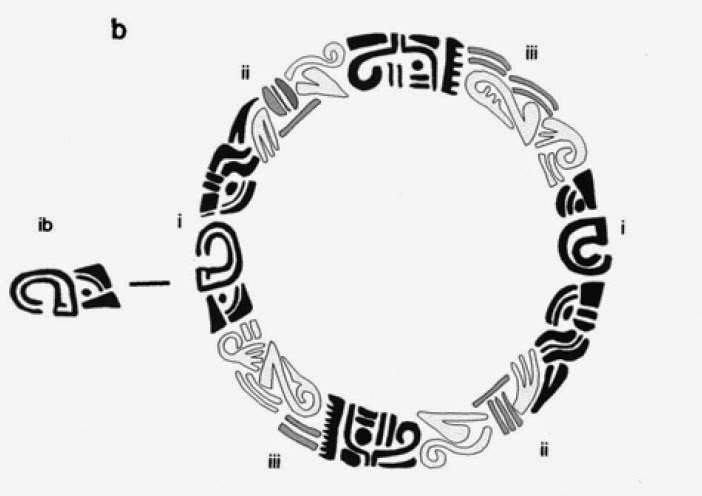 Around it, a frieze of Salin style-I beasts form a ring, within which sits a central “sun-like” motif. “[The Disc from Bidford 182] clearly depicts three anticlockwise animal-men repeated almost exactly to make a frieze of six. Animal 1 is head alone (protome); either a human with a plumed headdress or a bird with a coiled beak. Animals 2 and 3 are single-limbed; the former’s leg appears to pass through its transverse body-block (unless that is merely a over-large anklet); the latter’s head has a bird-like beak in a bold, transversely ribbed neck-collar.” (Dickinson, 2005). The central motif has not been discussed, and could be dismissed as simple space-filling. However, startlingly similar motifs feature on the more elaborate of the Taplow drinking horns (late 6th to early 7th century) and occasionally pop up in Roman contexts too. Particularly in the case of the Bidford disc, the resemblance to rudimentary depictions of the sun is hard to dismiss. The tentative identification of this central motif as a solar symbol ties in well with theories concerning the meaning of other artistic elements of the boss discussed below. Decorative apex discs appear more frequently in Anglian contexts, and though this disc is one of the largest, it is not this detail which makes the find stand out: The boss flange (featuring five tin-capped rivets) is supplemented with five fascinating gilded cast copper-alloy decorative plates fixed by means of small rivets. These plates, consisting of a central lozenge containing an interlace motif, beset by two outward-facing beast heads (“back to back”), have few adequate artistic parallels. The beast heads themselves are unusual in style and for a long time defied classification. Various details including the positioning and shape of the eyes, and the curling tips of the jaws, however, bear close resemblance to type-specimens such as the Danish Gummersmark Brooch, therefore placing these into Haselhoff’s phase A of Salin Style I art, with a confidently 6th century date (Dickinson, 2005). Middle section of the 6th century Danish Gummersmark Brooch, showing characteristic Haselhoff Phase A elements. Curling mouths of the beasts, eye shape and vertical collars correspond with the Bidford-182 flange appliques. It is important to stress the rarity of shield-boss decoration beyond the apex button, which has been found in only two other English examples; Eriswell 104 and Sutton-Hoo Mound 1. The flange decoration of Bidford 182 is, however, quite distinct from these in terms of style, with gilded copper alloy zoomorphic appliqués and non-figural silvery rivet-heads coming together to make a continuous ring-frieze to some extent emulating that of the disc. The board was further adorned with a pair of decorative disc fittings. Though such fittings are fairly common on shields of the 6th century, particularly in the neighbouring upper Thames valley region, they are typically of tinned or silvered iron. 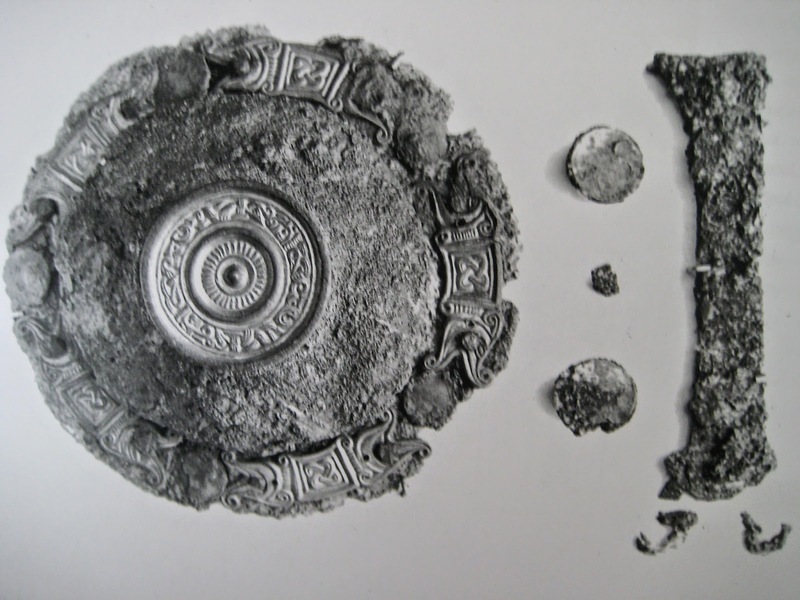 This is true at Bidford too, in the case of other shield finds, but the shield from grave 182 is notably different, with modestly sized gilded discs, such that Dickinson was forced to classify them as “non-figural gilded mounts” (Dickinson & Härke, 1992). 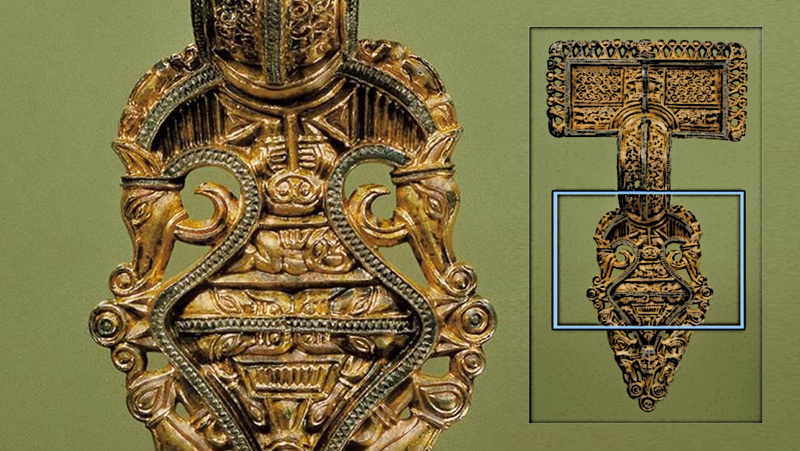 This highly unusual feature, together with the decoration of the boss sets this shield far apart from others, and it is interesting to speculate what, if anything, such distinctive features may have originally signified. Inferring meaning from early Anglo-Saxon art is notoriously difficult, although there is reason to believe that, often, personal art would have been designed with symbolism in mind, with motifs relating to elements of storytelling tradition and mythology. The Bidford-182 boss challenges commentary, with the highly stylized beast-heads defying identification even of the animal being represented. Certainly, the overall effect is one of pursuit; shining discs beset by shimmering beasts with gaping mouths, while smaller animals dance around a central solar symbol. With the scarcity of preserved pre-Christian Germanic mythology, the nearest parallels are quite far flung. The overall impression best fits that of Sköll and Hati of Norse mythology; great wolves doomed to chase the sun and moon across the sky until, at Ragnarök, they will finally catch up and devour both. We have no concrete evidence that a variant of this apocalypse story was told among pagan Anglo-Saxons, nor that the tale (or in particular, this aspect of it, which appears only in one version, in the Prose Edda) dates back further than the 10th century. Nevertheless, the notion of a great beast devouring the sun is a simple type of ancient “eclipse myth” common to many cultures, so perhaps it is this that we see cryptically depicted on the flange of the boss from Bidford. Although exploring the meaning of these pieces of ornamentation to their original designer or owner(s) is necessarily an exercise in informed speculation, we can be rather more certain about what these items mean for our understanding of the individual with whom they were buried. 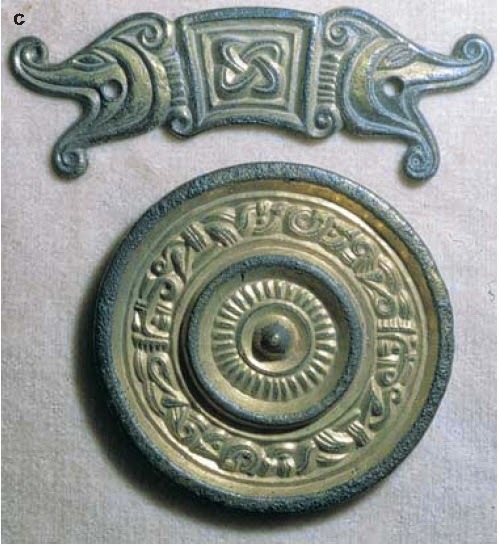 Style-I animal ornamentation (usually with precious metal surface treatments) is an uncommon feature of shields of the 6th century, and it has been noted that shields bearing such features are more commonly associated with other high status grave-goods (such as swords or ornate vessels) (Dickinson, 2005). The inclusion of the sophisticated work of skilled artisans, working in precious metals, on a usually utilitarian object would have been a highly visual statement of wealth and importance. The array of goods as a whole (including spear, knife, unique decorated shield, and valuable bronze cauldron) is the richest of any male in the cemetery and illustrates the importance of the individual buried with them, who may have, at the very least, been a leader among the community. Such goods do not (as is occasionally erroneously implied) represent the sum total of the possessions or wealth of the deceased, but what the living could afford and justify sacrificing as a mark of respect and devotion. A man who owned nothing but a shield, spear, knife and cauldron would not have been especially wealthy, but a man buried with such items must have been respected and wealthy indeed. Meaning aside, the decorative features of the shield boss appear to have been valued as heirlooms, with the flange-appliqués showing evidence of having been re-fitted on at least one occasion, with the integral rivets carefully filed down and replaced with rivets running through holes punched at the mouths of the beasts (Humphreys et. al., 1925). Marks from filing of old solder on the back of the apex-disc further suggest that this, too, was refitted, and may have originally sat on another boss altogether. Such cases (where items have remained in use for a long time, or have been altered in antiquity) represent a challenge for reconstruction, as finds can only be replicated with a particular moment in time in mind. After much discussion we settled on attempting to replicate the shield as it would have been when deposited in the grave, thereby allowing us to make maximal use of evidence from the grave, and keeping speculative elements to a minimum. Reconstructing this impressive high-status early shield was always going to be a challenge. Having been excavated in 1924, the find was not subject to modern analytical techniques or conservation and despite the admirable efforts of its most recent keepers (the Shakespeare Birthplace Trust) has survived the last 90 years rather more poorly than it had survived the previous 1300. By far the greatest challenge of this project has therefore been piecing together evidence from various rare sources, tracing the finds themselves, and making appropriately conservative and well-reasoned choices for details of the reconstruction where available evidence was not forthcoming (particularly with respect to organic elements), usually instead being informed by the precedent set by other contemporaneous finds. As far as possible however, our reconstruction has been informed by inferences from personal examination of the finds themselves, kindly facilitated by the Shakespeare Birthplace Trust. Glimpse of elements of the reconstruction of the shield from Bidford 182. The result, we hope, provides a convincing impression of what this unique shield may have looked like at the time it was deposited in the grave, with organic components representative of early Anglo-Saxon shields in general. We hope, further, that this functional reconstruction will help shed new light on the long forgotten find, allow the story of the find to be told, and allow greater appreciation of the skilled craftspeople who built the original. The process of reconstructing this magnificent find is discussed in part 2 . Shakespeare Birthplace Trust - collections department, who provided crucial information and kindly allowed us access to the original remains. Bullock, H. Baldwin, A., Hood, J., Fern, C., Cartwright, C., Lang, J., Wang, Q. (2011) Evidence for shield construction from the Anglo-Saxon cemetery site of Tranmer House, Bromeswell, Suffolk. The British Museum Research Bulletin (Volume 5). Dickinson, T. M., & Härke, H. (1992). Early Anglo-Saxon Shields (Vol. 110). Society of Antiquaries of London. Dickinson, T. M., & Härke, H. (1992). II: Typology of Metal Shield Fittings.Archaeologia (Second Series), 110, 4-30. Dickinson, T. M. (2005). 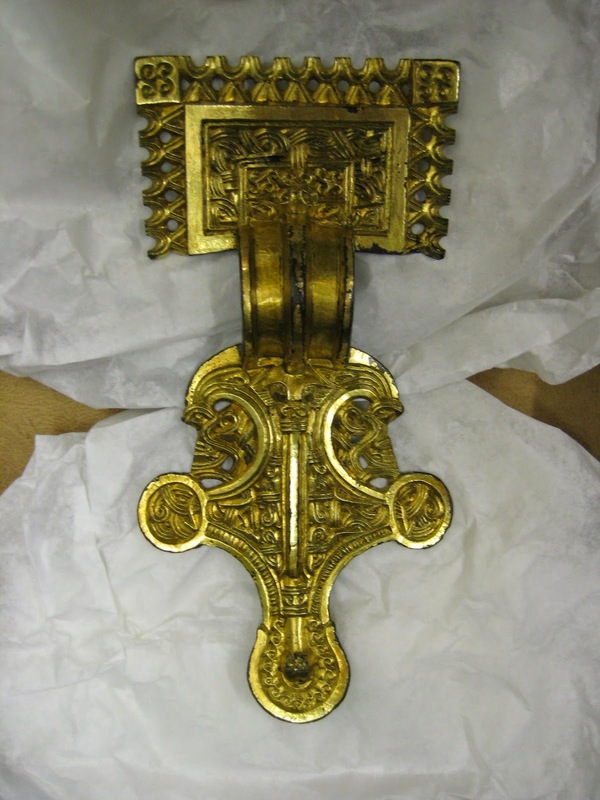 Symbols of protection: the significance of animal-ornamented shields in early Anglo-Saxon England. Medieval Archaeology,49(1), 109-163. Haseloff, G. (1981). Die germanische Tierornamentik der Völkerwanderungszeit. Studien zur Salin’s Stil I.
Humphreys, J., Ryland, J. W., Barnard, E. A. B., Wellstood, F. C., & Barnett, T. G. (1923). V.—An Anglo-Saxon Cemetery at Bidford-on-Avon, Warwickshire.Archaeologia (Second Series), 73, 89-116. Humphreys, J., Ryland, J. W., Wellstood, F. C., Barnard, E. A. B., & Barnett, T. G. (1925). XII.—An Anglo-Saxon Cemetery at Bidford-on-Avon, Warwickshire: Second Report on the Excavations. Archaeologia (Second Series), 74, 271-288. Richards, J. D., & Naylor, J. (2010). A'Productive Site'at Bidford-on-Avon, Warwickshire: salt, communication and trade in Anglo-Saxon England. In A Decade of Discovery: Proceedings of the Portable Antiquities Scheme Conference 2007 (No. 520, pp. 193-200). Archaeopress.